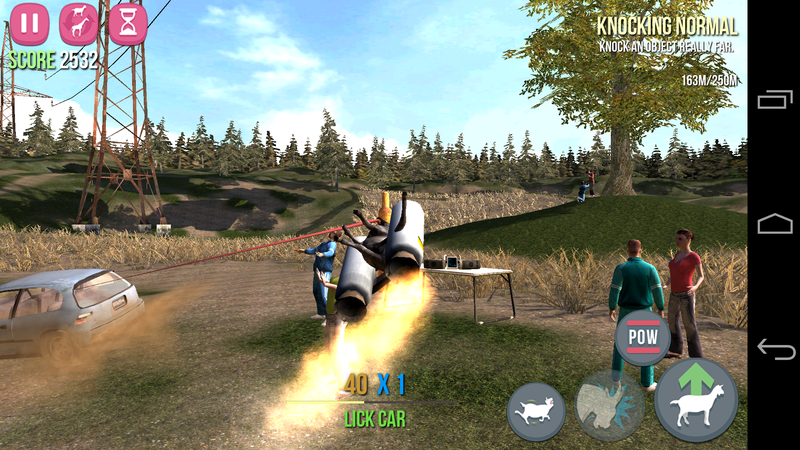 Goat Simulator is a bizarre, unrealistic and consistently hilarious video game. After winning the hearts of players on PC, Mac and Linux, developer Coffee Stain Studios is bringing the insanity to mobile. The app is available for both Android and iOS devices, retaining much of the charm and absurdity of the original version. You move the goat around with a virtual stick, tapping on screen buttons to jump, headbutt, or grab an object with its tongue. There are tons of quests and achievements to unlock, but much of the fun spawns from simply running around and causing mayhem. When the action starts to plateau, try tapping the goat switcher icon in the top left-hand corner. A range of different outfits and character modifiers are available – our favorites include Spider-Goat and the ridiculously powerful jet pack. If you’re patiently waiting for the release of iOS 8 and have $4.99 to spend, you now have the perfect way to kill a few hours. Go forth and enjoy.